JUNEAU — The Alaska Senate's vote Friday against the House's income-tax proposal was an emphatic rejection of one key deficit-reduction measure — and a move the Senate GOP majority's base embraced. 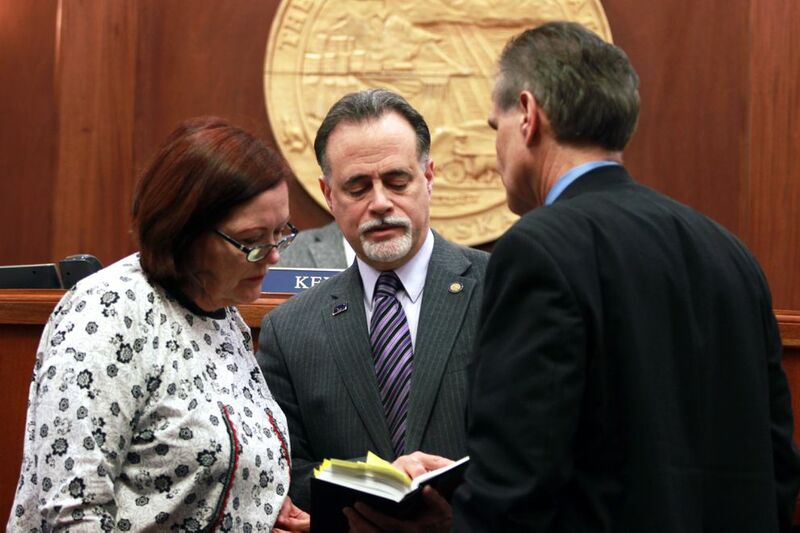 But in doing so, the senators also torpedoed a bill House leaders describe as essential — underscoring how little progress the two chambers have made on bridging the political distance between them after nearly four months in Juneau. With the constitutional deadline for the end of the session looming Wednesday, the House and Senate still haven't reached agreement on a budget, a restructuring of the Permanent Fund or any extra revenue measures to help fill the state's $2.5 billion deficit. And both sides of the Legislature's deficit standoff — the largely Democratic House majority and the Republican-led majority in the Senate — described Friday's vote as a setback. "We are so far apart — it leads us to another 30-day session. I really, truly think it does," said Kodiak Republican Sen. Gary Stevens, a former Senate president, who voted against the income tax. "Folks just have to listen to both sides, listen to everyone and try to find some common ground." But neither chamber seemed willing to budge, even though they're nearly a month past their 90-day deadline set by voters in a 2006 citizens initiative. Since that initiative was a law, and the Legislature writes its own laws, the 90-day deadline can be disregarded. "Why should we make concessions if other concessions aren't being made? It's a negotiation," said Rep. Zach Fansler, D-Bethel, a member of the House majority that voted unanimously for the income tax last month. At a news conference after Friday's vote, Senate President Pete Kelly, R-Fairbanks, declared "the big news is that we killed an income tax." "Compromising is not the goal here," he added later. "Doing what is in the best interest of Alaska is the goal here." Kelly's entire Republican-led majority voted against the bill — with the exception of Sitka Republican Sen. Bert Stedman, who was absent — as did Anchorage Sen. Bill Wielechowski, a member of the Senate Democratic minority who said he wanted to see higher taxes on oil companies. The other four minority Democrats were the only "yes" votes for the measure. Another Democrat, Sen. Lyman Hoffman of Bethel, a member of the Republican-led majority, was among the "no" voters. He said on the Senate floor, "at some point, I do believe an income tax has to be part of the solution," but added "we should be working on things that we can agree upon." Senate majority leaders for months have broadcast their opposition to the income tax measure, House Bill 115, which would take more from higher-income Alaskans than low-income ones. It would raise an estimated $700 million, which the House majority says could balance the state's $2.5 billion deficit if paired with Permanent Fund dividend reductions. The income tax is called "graduated" or "progressive," because it takes a larger percentage of income from high earners. Reducing Permanent Fund dividends is similar to a sales tax and called "regressive" because it takes a larger percentage of the income of low earners. The Senate says the state's billions in reserves are enough to cover a deficit of hundreds of millions of dollars that would remain under their deficit-reduction plan. That plan includes dividend reductions paired with cuts to the university system and schools, which are opposed by the House majority. The House majority named HB 115 the "Education Funding Act." It directed income taxes toward public education, though because of the state Constitution's ban on earmarking revenue for a specific purpose, there was no guarantee the proceeds would have been spent on schools. Honoring a pledge like that would be up to each successive Legislature. Gov. Bill Walker, who has pressed for budget reforms — including a broad-based tax — for the past two years, also issued a statement after the vote saying he was disappointed, pointing to Alaska's status as the only state without a tax on income or sales. "We simply cannot continue to fund public safety, education and road maintenance by drawing down on our limited savings," the statement quoted Walker as saying. Friday's vote came after speculation from conservative commentators earlier in the week that the Senate's resolve against the tax was starting to waver after hearings on the legislation in the Labor and Commerce Committee. "Rumors started swirling that the Senate was caving," Republican blogger Suzanne Downing wrote Wednesday on her website, Must Read Alaska. That same day, the Senate majority scheduled its vote on the income tax, which members said on Friday was intended to quash doubts about their position. 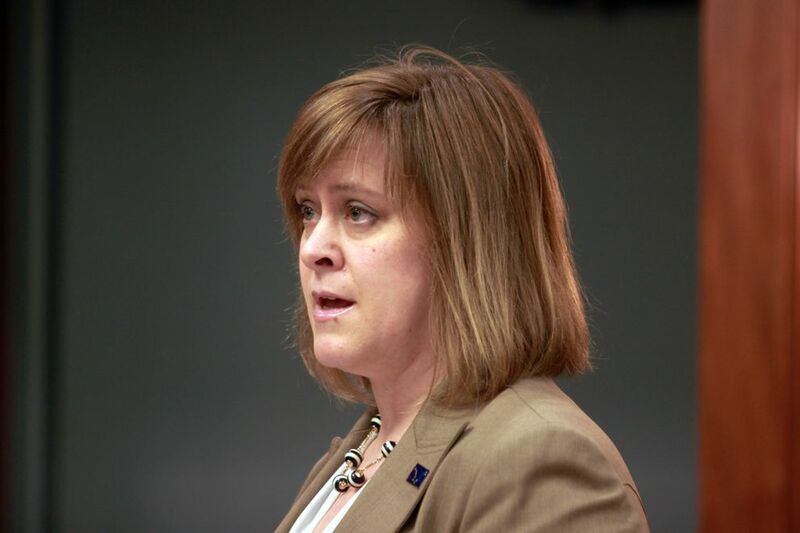 "There have been lingering questions about where we stand on an income tax," said Mia Costello, R-Anchorage. "What we saw today was a strong vote that says this is off the table." Kelly said the majority wanted to end the discussion about what he described as "penalizing" people "for having a job." "It's not good for the economy, it's not good for Alaska, it's not good for the future. Most of all, it's not needed," Kelly said. The four Senate Democrats, like House leaders, said the income-tax measure would place a smaller burden on poor families than rich ones — balancing the cuts to the Permanent Fund dividend proposed by both chambers. Raising $500 million for the state budget with dividend cuts would take 7.2 percent of the income of the lowest 20 percent of earners, compared to 0.2 percent from the top 1 percent, according to an analysis by the Washington, D.C.-based Institute on Taxation and Economic Policy. An income tax designed to raise $500 million and structured like the House proposal would take just 0.1 percent of the income of the lowest 20 percent of earners, compared to 2.8 percent from the top 1 percent. Senate Democrats also said an income tax would help stabilize the state's economy after years of uncertainty about how the Legislature would resolve deficits. "We all want private-sector investments. So let's get state government stable so we stop scaring the private sector," said Juneau Democratic Sen. Dennis Egan. At their news conference, Senate leaders wouldn't point to any concessions they'd be willing to make to the House in exchange for taking the income tax out of play. Kelly pointed to a Senate bill to eliminate cash subsidies for oil companies, which is one of the House's priorities. But the Senate has also rejected a House proposal to increase oil companies' baseline tax rates. "The problem is that the Senate has moved the barriers out — lined us out so far that they're not demonstrating any interest in negotiating whatsoever," said Anchorage Democratic Rep. Ivy Spohnholz. Both chambers have passed their own budget plans and their own versions of legislation to restructure the Permanent Fund — and they've also advanced bills to reconfigure the state's oil tax system. But the differences between the House and Senate proposals remain unresolved. Meanwhile, House majority members said they would be open to negotiating a smaller income tax, or another type of broad-based tax. But neither the House nor the Senate has advanced alternative proposals like a sales tax, or a scaled-down income tax. Stevens said he thought the state would end up with an income tax within the next two or three years. 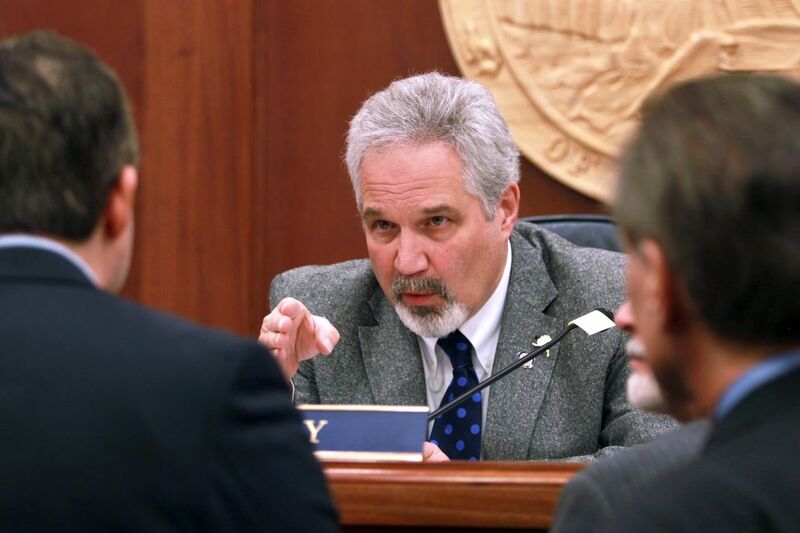 But this year, some of his Senate colleagues — particularly those from the deeply conservative Mat-Su area — will "never, ever accept an income tax," he said, even as some House majority members are equally committed to the proposal. Stevens said the impasse reflects an electorate still split over the best way to fix the state's budget. "This job — if it were easy, we would have done this a long time ago," Stevens said. "It's not easy because the public is divided."